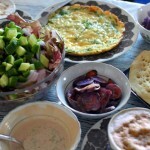 Today’s version of our weekly ritual included oatmeal-whole wheat waffles, a spinach-cheese omelet, a nice fresh mixed-green salad, a few of our homemade olives, and, of course, coffee from David’s Coffee at 49 Levinsky, my favorite coffee roaster. These waffles are relatively dense and dry, due to the whole grains, but they go great with syrup, especially the best maple syrup you have. Not only that, they’re quite filling — you’re not just eating white flour for breakfast. This recipe makes about 10 waffles. You’ll need, in this order: 1/2 cup butter, 2 tablespoons brown sugar or honey, 2 tablespoons baking powder, 1/2-1 teaspoon nutmeg, 3/4 cup oatmeal, 2 eggs, 1 cup white flour, 1 cup milk and 1 cup whole wheat flour. Heat up the waffle iron, and add 1/3 cup of batter to each waffle well (our waffle iron makes waffles about 4 inches square). Close the iron and let it work for 3-4 minutes, until waffles are browned. 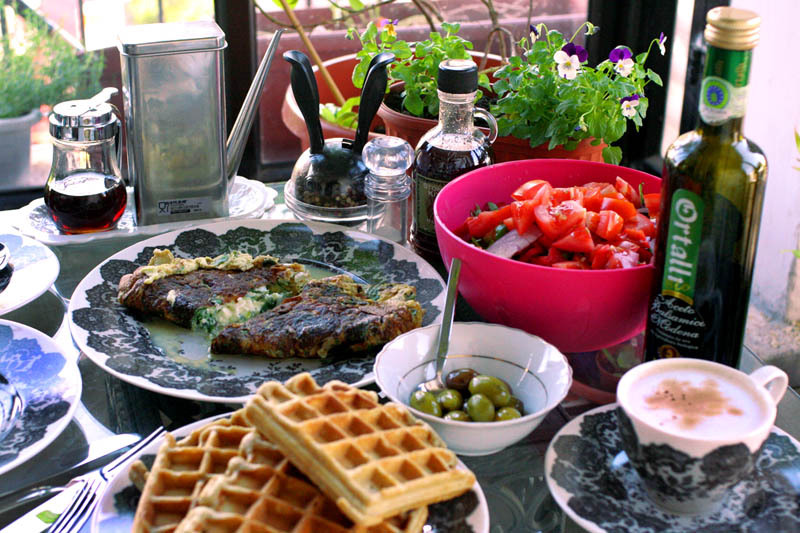 Serve immediately (we sometimes set it up right by the table, to eat the waffles right as they come out). 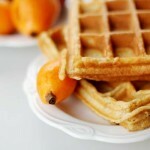 For those without a waffle iron: The batter can also be made thinner, in order to make pancakes. Just add an extra 1/2 cup milk. 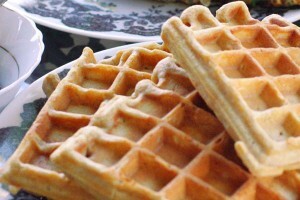 Regarding my waffle/pancake philosophy: Some people use margarine or oil instead of butter, and water instead of milk. 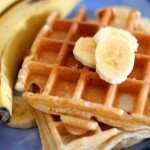 While this will give you the proper texture, it creates a waffle/pancake with less flavor. Go ahead, use the more expensive ingredients; you deserve it. Today we used lettuce, mixed greens, purple onion, tomato, red pepper and cucumber, and topped it with olive oil and organic balsamic vinaigrette (our souvenir from Italy) at the table. This was a direct factor of the vegetables in our fridge. 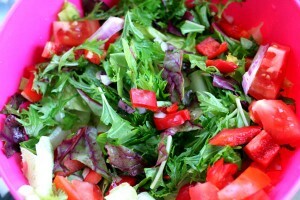 Of course, everyone has his or her favorite salad ingredients. 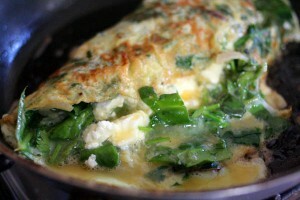 Hope this inspires someone to have a great brunch! 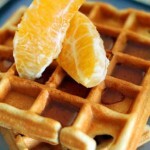 2 Responses to "Saturday brunch with oatmeal waffles, omelets and more"
I like the waffle recipe. We are always looking for “healthier” options for our kids (okay, us too). We use whole wheat flour whenever we can. Hey Greg, thanks for dropping by. I actually haven’t made that recipe in a while, it’s nice to get a reminder.